We have so many wonderful places to see wildlife in Wales, but a visit to Skomer Island always feels like a very special event. The Countryside Council for Wales (now CCW but at the time The Nature Conservancy Council) and the Wildlife Trust of South and West Wales together bought the island in 1959. It is managed by the Wildlife Trust of South and West Wales. The boats for the Skomer Island depart from Martin's Haven on the coast of Pembrokeshire. 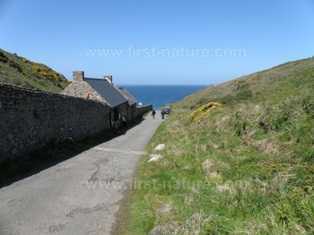 From Haverfordwest take the B4327 towards Dale and then follow signs to Marloes, and Martin's Haven. The small harbour is along unnamed roads, but there are plenty of road signs. BOAT TRIPS TO THE ISLAND ARE WEATHER DEPENDENT, SO PLEASE CHECK THE FORECAST ON THE DAY YOU PLAN TO TRAVEL. EVEN A MODERATE WIND FROM THE NORTH WILL MAKE LANDING ON THE ISLAND TOO DANGEROUS. THIS ALSO MEANS THAT YOUR STAY ON SKOMER COULD BE CUT SHORT BY THE REQUIREMENT TO TRAVEL BACK TO THE MAINLAND EARLIER THAN PLANNED. From the 2011 season onwards it is now possible to pay for Landing Fees for the island at a kiosk at Martin's Haven, whereas previously this had to be done on the island immediately after arrival. Purchase of the Landing Fee will automatically include a colour-coded ticket for a boat seat, which indicates which boat you should catch to Skomer. Don't worry if you have a bit of a wait because there is plenty to do: a visit to the Marine Nature Reserve exhibition (in the building shown here, which is situated on the left-hand side of the lane down to the boat jetty); or take a look around Lockley Lodge, which has information about the island and a shop where you can buy drinks etc. Landing Fees/Boat Tickets can be purchased only on the day of travel, and they are sold on a first come first served basis. Payment for your Boat Ticket is collected by the Skipper upon boarding. PLEASE NOTE: ONLY CASH IS ACCEPTED FOR BOAT TICKETS AND LANDING FEES, AND LOCKLEY LODGE CANNOT OFFER CASHBACK. 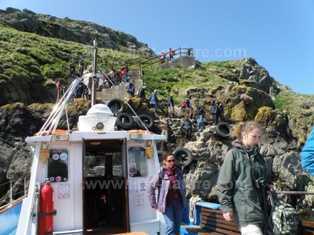 The Boat to Skomer runs from 1st April (or Good Friday if sooner) to the end of September. There are no landings on Mondays (except on Bank Holidays). Boat Timetable - boats depart from Martin's Haven at 10am, 11am and 1200. Return trips from the island commence at 3pm. At peak times additional crossings are available. Boat Fare - £11 per adult, £7 per child. Babies under one year - free of charge. Landing Fee - £10 per adult, Senior Citizens £9, Students £5. For members of the Wildlife Trust of South and West Wales, landing on the island is free of charge. Lockley Lodge is open from 1st April to 31st October. There are lots of steep steps at both ends of the journey and it is quite a clamber to get in and out of the boat, although the crew will always give a hand. The boat trip is about 10 minutes in either direction and can be choppy. Even in warm weather a good waterproof coat is advisable for this short journey. Once on the island there are plenty of paths to follow in order to see the wildlife, but although these are generally good they are rough and steep in places. There are public toilets at Martin's Haven, where you embark for Skomer. The shop sells drinks and snacks, but you will need to take drinks and a picnic with you for your day on the island. There is a public toilet on Skomer about 800m (1/2 mile) from the landing jetty. You will find plenty of spots along the tracks to settle down and enjoy your picnic on a fine day. There are information boards and maps of walks at the landing point on Skomer. 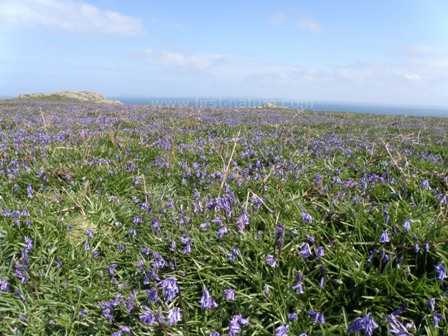 If a day trip is not enough for you, it is possible to stay overnight on Skomer in comfortable accommodation. The hostel has just been awarded 3 Stars by Visit Wales. There is sufficient room for 16 people to stay overnight in five rooms. There are two rooms each with two single beds, one room with three single beds, one room with a double bed and two bunk beds; and the largest room, with three single beds and one bunk beds, accommodates up to five people. The accommodation is managed by the Wildlife Trust of South and West Wales. You will be supplied with a duvet and pillows, but you need to bring your own bed linen - duvet cover, pillowcase and undersheet - as well as towels. There are no laundry facilities on the island and nowhere to dry wet clothing, so make sure that you are well equipped to cope with the possibility of inclement weather. You will also have to take with you food that can be prepared in the communal self-catering kitchen, which is equipped with a fridge and a cooker. Electric power is limited, and so here is no microwave oven. Your luggage will be transported to the accommodation by a tractor that meets the 10am crossing, and it will be taken back to the boat on the day of your departure. Solar-heated showers and hot water are available, but water supplies are limited. You need to be mindful of how much you use so that there is enough for everybody. If you are going to stay overnight on Skomer, you will receive a ticket for the 10am crossing to the island, and on the day you leave you will be required to vacate your room by 9am. You will be given contact numbers for staff on the island, and you will be asked to supply a mobile telephone number so that the Visitor Services Officer can contact you if necessary. Most of the island is some 60m (200ft) above sea level, and the coast consists of steep sea cliffs. At one point the island is almost bisected except for a narrow isthmus. The interior of Skomer is maritime grassland with excellent wildflowers, and there are small streams and man-made ponds. Skomer and its near neighbour Skokholm Island are best known for their large breeding populations of seabirds which include Manx Shearwaters (Puffinus puffinus), Guillemots (Uria aalge), Razorbills (Alca torda), Cormorants (Phalacrocorax carbo), Kittiwakes (Rissa tridactyla), European Storm-petrels (Hydrobates pelagicus), Common Shags (Phalacrocorax aristotelis), Oystercatchers (Haematopus ostralegus), and of course, Puffins (Fratercula artica). Together Skomer and Skokholm are the world's most important breeding area for Manx Shearwaters. An overnight stay is the only reliable way of seeing these birds, which spend the day out at sea and only return at dusk, before setting off again before dawn for their fishing grounds up to 50km (30 miles) away. They nest in rabbit burrows and are reported to return to the same burrow year after year. On land they are extremely ungainly and vulnerable, and many are killed by the islands' populations of Greater Black-backed Gulls (Larus marinus), which is why the Manx Shearwater's have to leave and return under cover of darkness. Once the young birds have fledged they migrate to the South Atlantic. where they remain at sea for up to five years before returning to breed as close as possible to the burrow in which they hatched. The Puffins are much easier to see! There are around 20,000 visiting Puffins on Skomer each year, and a further 6,000 on nearby Skokholm island. 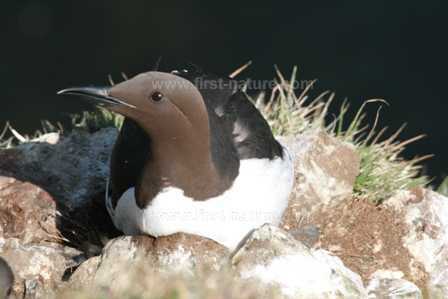 They arrive in April and, like the Manx Shearwaters, nest in the numerous rabbit burrows on the islands. Puffins are an absolute delight to see, and they seem to be completely fearless of human visitors, presenting 'photo opportunities' at every turn. In the early part of the season they can be seen scurrying into their burrows with various bits of vegetation, and later flying in with their beaks full of small fish or sand eels upon which they and their young feed. By the end of July the Puffins depart until the following year. 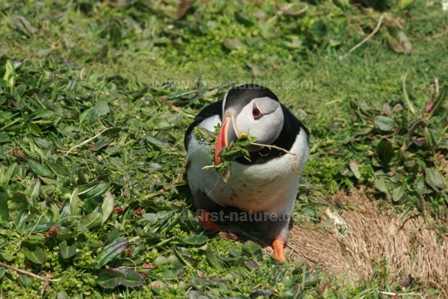 The best way to be sure of seeing Puffins is to visit Skomer or Skokholm from early June onwards, when the hard work of feeding a family keeps them coming back to the islands. Puffins and Manx Shearwaters may well be the stars of the Skomer show, but there are many other birds to see and enjoy during your visit to the island. Birds of prey on the island include Kestrels (Falco tinnunculus), Peregrin Falcons (Falco peregrinus), Buzzards (Buteo buteo), Little Owls (Athene noctua) and Short-eared Owls (Asio flammeus). 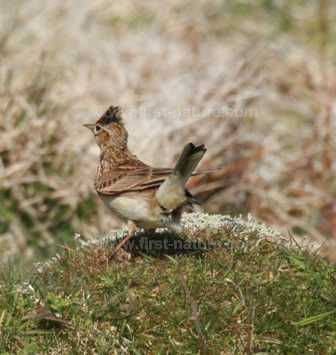 Below: The Skylark's song must be one of the very best. The varied habitats on Skomer make this an ideal place for many smaller birds. Pied Wagtails (Motacilla alba yarelli), Reed Buntings (Emberiza schoeniclus), Dunnocks (Prunella modularis), Blackbirds (Turdus merula), Common Whitethroats (Sylvia communis) and Wrens (Troglodytes troglodytes) are all found on the island; and the North Pond has a very good list of of breeding waterfowl including Shelducks (Tadorna tadorna), Gadwalls (Anas strepera), Common Teal (Anas crecca), Shovelers (Anas clypeata) and Tufted Ducks (Aythya fuligula). Coots (Fulica atra), Moorhens (Gallinula chloropus) and Mallards (Anas platyrhynchos) also breed on Skomer, and from overhead the wonderful song of the Skylark (Alauda arvensis) can be heard. Other interesting wildlife on Skomer includes a breeding population of Glow-worms (Lampyris noctiluca). These beetles are noted for their special organs which produce light by oxidising a compound called luciferin; in this way the females are able to attract males at night. 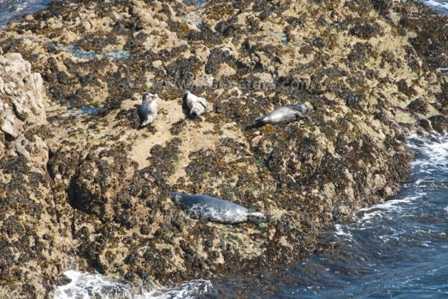 Rather larger and easier to see than the Glow-worms are the Grey Seals that bask on the rocks in the sun, and looking out to sea there is always a chance of catching a glimpse of a Harbour Porpoise or two. Another Skomer speciality is the Skomer Vole (Clethrionomys glareolus skomerensis). 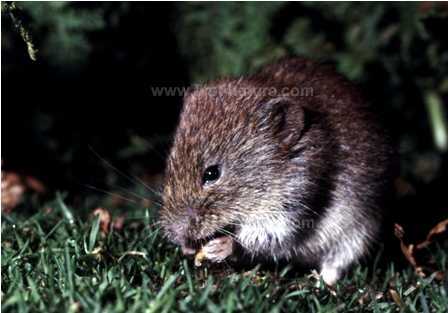 This subspecies of the Bank Vole (Clethrionomys glareolus) is endemic to the island. In the absence of land-based predators, this little animal has a population that can reach 20,000 during the summer months. Skomer Voles are hunted by the resident Short-eared Owls, however, so they don't have everything their own way!